Have you seen the 2016 centennial gold coins yet? They showcase 3 beloved Liberty coin designs that the U.S. Mint first struck in 1916. The 2016 Liberty centennial gold coins honor the 100th anniversary of the Mercury dime, Standing Liberty quarter, and Walking Liberty half dollar. They are silver coins that all debuted in 1916 during the so-called Renaissance of American Coinage. The Mercury dime, Standing Liberty quarter, and Walking Liberty half dollar widely circulated for several decades and were among the first coins that people saved for their coin collections. Even advanced coin collectors enjoy these old silver coins, with many paying thousands of dollars for beautiful examples in gem uncirculated condition with complete details! When these 3 classic silver coins reached their 100th anniversaries in 2016, the U.S. Mint reissued the designs on special gold commemorative coins. 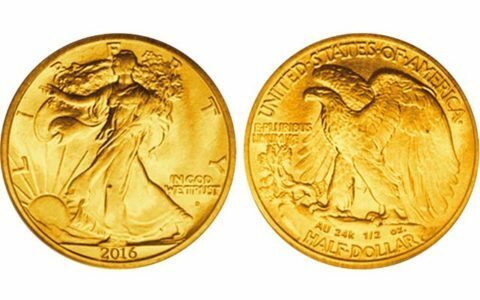 The Renaissance of American Coinage began in earnest in 1907 with the release of the beautiful Saint-Gaudens $20 double eagle gold coin, designed by renowned sculptor Augustus Saint-Gaudens. Roosevelt, who took a fascination in coinage, wanted Saint-Gaudens to redesign all American coins. However, it wasn’t to be. The artistic genius died of colon cancer on August 3, 1907. The only 2 U.S. coins to his credit are the $20 Saint-Gaudens gold double eagle and $10 Indian Head eagle gold coins. A 3rd separate designer was to have been chosen, allowing each of the 3 silver denominations at the time (there was no silver dollar issued in 1916) to be designed by different artists. However, the judges so enjoyed Weinman’s entries for the dime and half dollar that they opted to have him design both of those coins. Did You Know?… Weinman was a noted sculptor whose other works include architectural statues, including the Eagle at the National Zoo in Washington, D.C., and the Civic Fame sculpture atop the Manhattan Municipal Building in New York City. MacNeil also had several other prominent non-numismatic works to his name — including a bronze work known as The Sun Vow at the Metropolitan Museum of Art in New York City and the Civil War Soldiers’ and Sailors’ Monument near the Benjamin Franklin Parkway in Philadelphia. Weinman’s Walking Liberty half dollar has particularly earned a reputation of being one of the world’s most beautiful silver coins. The Walking Liberty half dollar is so revered by collectors (and the general public) that the U.S. Mint has been using the obverse design of that classic half dollar on American Silver Eagles since their debut in 1986. The trio of 2016 Liberty centennial gold coins are approximately the same size as their 90% silver predecessors from the first half of the 20th century. They’ve also been struck in a matte uncirculated finish. NOTE: Collectors who prefer brilliant proof coins should remember that the U.S. Mint didn’t make brilliant proof coins in 1916 — the period when the 3 coins honored on the 2016 commemorative gold coins were first made. Since the apparent goal with the 2016 centennial gold coins was to accurately replicate the 1916 Mercury dime, 1916 Standing Liberty quarter, and 1916 Walking Liberty half dollar, it wouldn’t be historically appropriate to produce the new commemorative Liberty coinage in a brilliant proof finish. 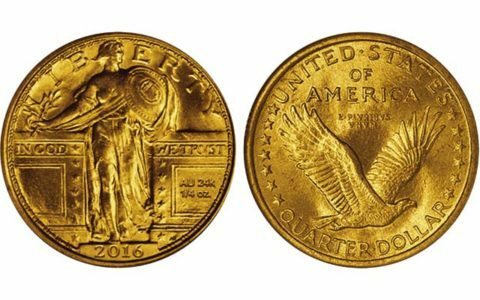 Some coin collectors lobbied to see the 2016 commemorative gold coins struck in proof. Others wanted them made in silver or platinum. Some even hoped to see 1916-2016 dual dating on the gold coins. Ultimately, the Mint stuck with the basics and faithfully replicated the designs of the 3 coins as they were seen in 1916 — yes, in gold rather than silver, but without any other bells and whistles. Did You Know?… The 1916 Standing Liberty quarter design caused such a controversy when it first hit the streets that the U.S. Mint recreated the design, dressing Miss Liberty in the more modest chain mail. This subsequently resulted in the creation of the Type 2 Standing Liberty quarter design, which spanned in production from 1917 through 1930. Each of the coins also features an AU mark — the elemental symbol for gold. The tiny AU marks are situated in a relatively inconspicuous place on each of the gold coins, along with the coin’s respective gold metal weight. The 2016 centennial gold coins were struck at the West Point Mint — so they bear a “W” mintmark. Many modern commemorative coins and other U.S. Mint products are quite popular with coin collectors, but the 2016 centennial gold coins received an incredibly special welcome from the numismatic community! For example, when the gold Mercury dime went on sale April 21, 2016, virtually all of the 125,000 coins sold out within minutes. 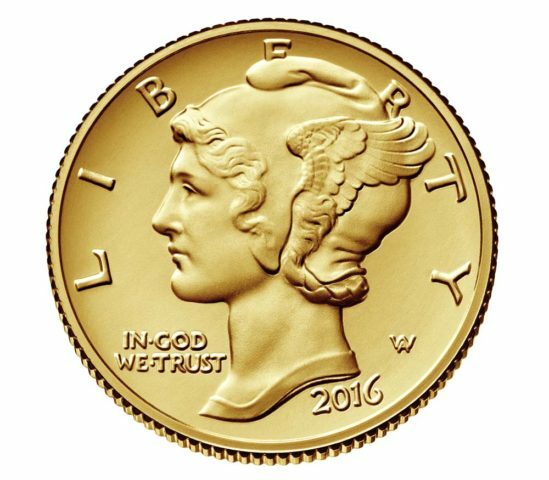 So, why are the 2016 Liberty gold coins so popular? They reboot 3 of the most popular U.S. coins of all time. These coins are made from 24-karat gold, meaning they’re virtually pure gold coins. The 2016 centennial gold coins have limited mintages, meaning they are relatively scarce. Let’s face it, coin collectors can’t help but love classic U.S. coin designs in a 24-karat gold format. Collecting modern coins that bear classic U.S. coin designs is a great way to enjoy the beautiful coinage of yesteryear, while getting to buy new coins with pure silver and gold content. It should be noted that most of the United States silver and gold coins from the past are only 90% pure — which is less than the .999% precious metal purity (or higher) that most modern-day bullion coins offer. Therefore, bullion collectors can get more investment bang for their buck by collecting modern gold and silver coins. And that’s just another of the many reasons why the 2016 Liberty centennial gold coins are so popular on the market. It can be risky to invest money in coins. But if you enjoy the classic U.S. coinage of yesteryear and want to buy gold coins either for numismatic enjoyment or financial investment, then the 100th anniversary 2016 Liberty centennial gold coins may be perfect for you and your coin collection. 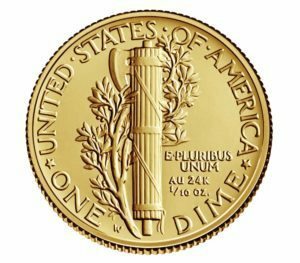 Mercury Dime Is A Myth?